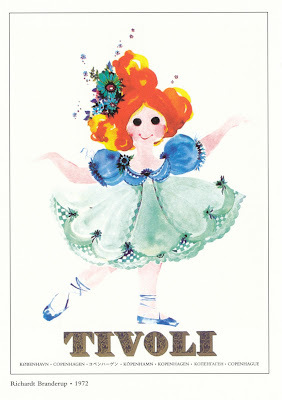 Last year I went to the most famous amusement park in Denmark called Tivoli. It’s located in central Copenhagen and is a very old and beloved park. Well, a lot of the park’s attractions, signs and decorations are designed by the Danish artist Richardt Branderup. 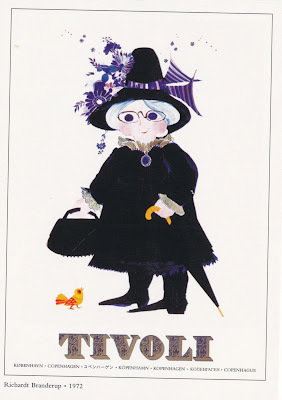 He has a very lovely and unique style, so when I came across a bunch of postcards with his designs I had to buy some for my design collection. 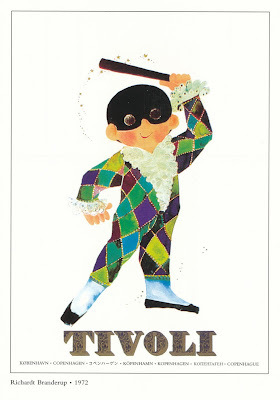 They depict some of Tivoli’s main characters called Harlequin and Columbine as well as other beloved characters. 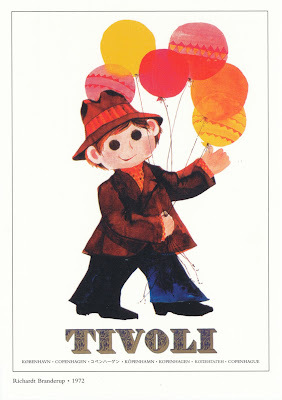 Richardt Branderup also designed a Hans Christian Andersen attraction for Tivoli where you get to see a lot of his fairy tales come to life. I’ll see if I can get some pictures of the park the next time I’m there, but for now you can enjoy the postcards.